Quinn and Graham’s perfect love is threatened by their imperfect marriage. The memories, mistakes, and secrets that they have built up over the years are now tearing them apart. The one thing that could save them might also be the very thing that pushes their marriage beyond the point of repair. 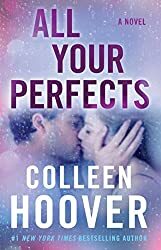 Born in Sulphur Springs, Texas, Colleen Hoover grew up in Saltillo, Texas, and graduated from Texas A&M-Commerce with a degree in Social Work. After college, she took a number of social work and teaching jobs before becoming a bestselling novelist. Hoover began writing her first novel, Slammed, in 2011 with no intentions of getting published. Inspired by a lyric—"decide what to be and go be it"—from an Avett Brothers song, "Head Full of Doubt/Road Full of Promise" and ended up incorporating Avett Brothers lyrics throughout the story. After a few months, her novel was reviewed and given 5 stars by book blogger, Maryse Black. From that point on, sales increased rapidly: both Slammed and its sequel, Point of Retreat, ended up making the New York Times Best Seller list. Since then Colleen has written and published over a dozen books. In addition to her writing, Colleen is the founder of The Bookworm Box, a book subscription service which donates 100% of its profit to charity. She also owns a specialty bookstore of the same name, Bookworm Box, located in Sulphur Springs, Texas.